Kabocha squash is one of my favorite squashes. Whenever I see it at the grocery store, I can hardly walk past without bringing one home. Kabocha has the perfect shape for a squash. It is very symmetrical and the average size is just about right for recipes that serve four. 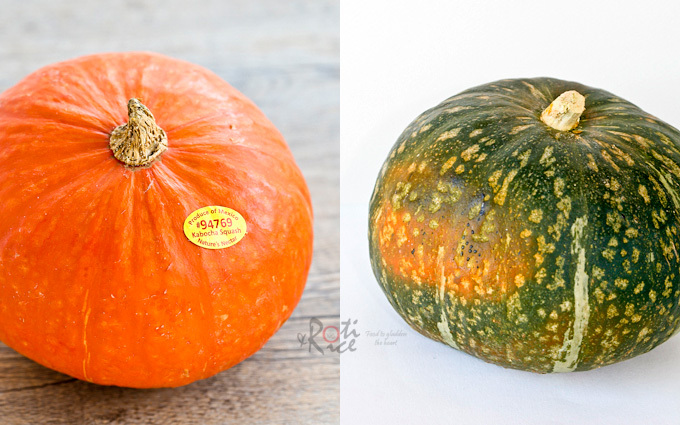 Up until this past weekend, I have always thought kabocha squash has a rind with mottled blue-grey striping. While walking through the produce section of a health food store with my dear friend, this beautiful bright orange squash caught my eye. I had to check it out and was totally surprised that it was an orange kabocha! I had to bring one home as I was curious about its taste and texture. When preparing the squash, the first thing I noticed was that the rind was not as hard as the green one. My knife went through the squash easily. Like its green counterpart, the color of the flesh was an intense yellow-orange color. After cooking, the texture was a little less fluffy but it was definitely sweeter than green kabocha. Kabocha cooks easily and the rind can be eaten. Since this orange rind is much softer and did not have too many “bumps” or blemish, I decided not to peel it. Of course it is totally up to you. You can remove the rind if you prefer. I used half of the squash for this Quinoa Salad with Kabocha and Roasted Garlic and saved the other half for another recipe. That worked out really well and the proportion of quinoa and squash was just about right. I threw in a bulb of garlic to give the dish a more savory taste. Unlike raw garlic, roasted garlic is mellow and quite delicious. Use the entire bulb or just a few cloves and keep the rest for another dish. I used the entire bulb. 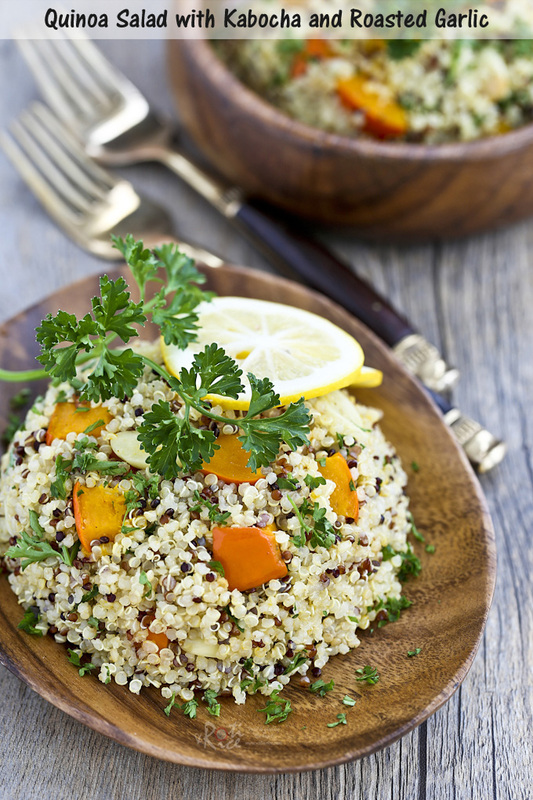 If you have never tried quinoa, this dish is a good place to start. My favorite is the tri-colored rainbow quinoa. It made a lovely presentation together with the bright orange kabocha squash and chunks of roasted garlic. The Meyer lemon and maple syrup dressing gave it a little zing. Peel away outer layers of garlic bulb, leaving skins of individual cloves intact. Slice about ½ inch off the top of garlic bulb exposing individual cloves. Place garlic bulb together with cubed orange kabocha squash in an oven proof dish. Sprinkle salt and pepper over garlic and squash. Drizzle with olive oil. Roast in oven for about 45 minutes until squash and garlic are tender. Rinse quinoa until water runs clear. Drain and place in a medium sized pan. Add 2 cups (480ml) water. Place on the stove and bring water to a boil. 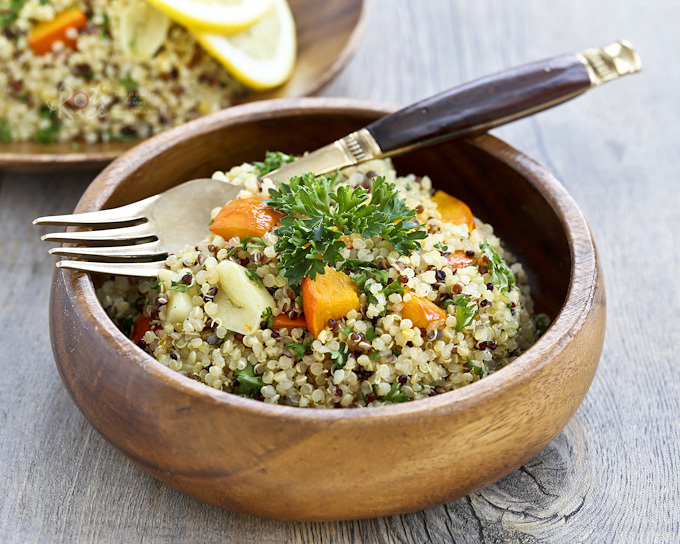 Reduce heat and let quinoa simmer until all water is absorbed, about 15 minutes. Turn off heat. When roasted garlic bulb is cool enough to handle, squeeze garlic cloves out of their skins. Using kitchen shears, snip garlic cloves into smaller pieces. Transfer cooked quinoa, roasted kabocha squash and garlic to a large bowl. Combine lemon juice, extra virgin olive oil, maple syrup, and salt in a small bowl. Stir to combine. Pour over quinoa, squash, and garlic. Mix with a spatula until well combined. Sprinkle chopped parsley over the top and serve warm. 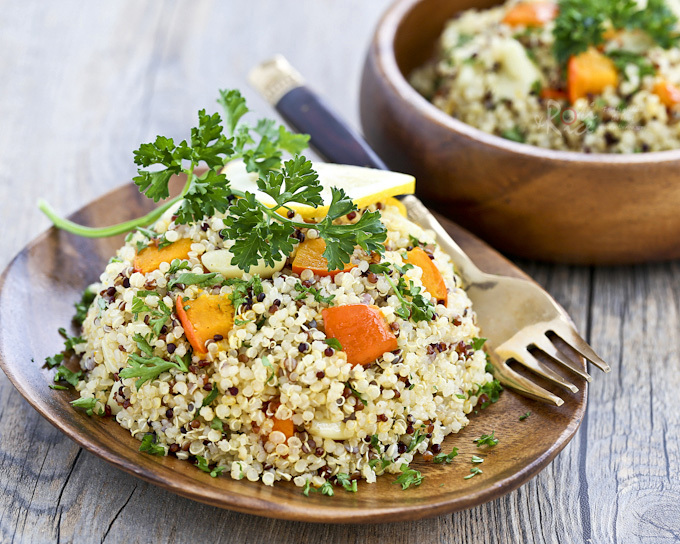 This Quinoa Salad with Kabocha and Roasted Garlic can be eaten on its own for a light and healthy lunch or as a tasty side dish. It will be delicious served with a stew. Looks very good! And amazing photography too!